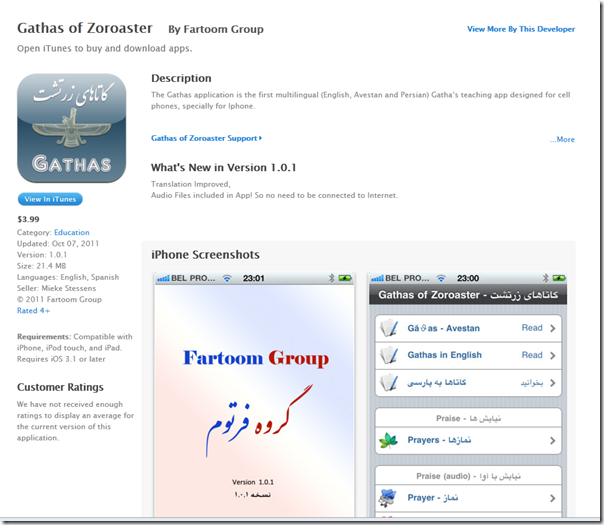 The Fartoom Group has come out with a very interesting iPhone and iPad app. The Gathas of Zarathushtra are now available for the listening and reading pleasure. The Gathas application is the first multilingual (English, Avestan and Persian) Gatha’s teaching app designed for cell phones, specially for Iphone. In this App, Gathas & Praise are sorted in two formats as scriptures & audio files, which will be installed completely on your cell phone. The Gathas are 5 hymns believed to have been composed by Zarathusthra (Zoroaster) himself. They are the most sacred texts of the Zoroastrian faith. Go ahead and download it and test it out.